c) Elastic scattering (that is, in which the nucleus remain uncharged). The mass and energy relationship projectiles interact by a nucleus are brought to fore. 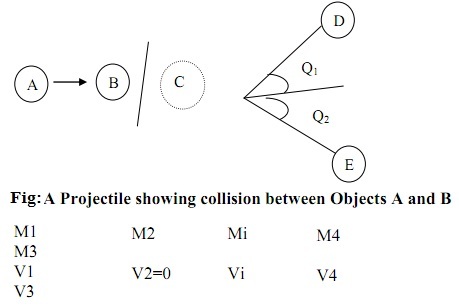 This describes a projectile in which substance A collide with target atom B, making intermediate system C. The C system split to product D and E. This is nuclear reaction V1 is > 0 but V2 is made to be zero. For radioactive decay, the energy numeration is represented by its Q value. Whenever mass disappears in the reaction (ΔMo < 0) energy is discharged, then the reaction is stated to be exoergic and 'Q' is positive. Here Ekin is translational, rotational, vibrational energy and Eomass = mass energy, Epot = gravitational, surface energy, electrostatic energy, chemical binding energy and so on. To have an Etot that comprises atomic masses in their grounds state Eomass, the excitation energy of the nucleus above its ground state Eexc, the absorption or emission of protons in the reaction Ev and c reaction between the charged particles, the electrostatic potential (that is, Coulomb) energy Ecol, and the columb energy should be zero or positive (that is, repulsive). The incoming projective should have adequate kinetic energy to overcome any repulsion. In the procedure of reaction of repulsion of charged particles, product yields in greater kinetic energy. The elastic scattering energy is replaced between the projectile and the target nucleus however the value of 'Q' is zero. A significant elastic scattering reaction is a nuclear reactor comprises the slowing down of neutrons from kinetic energies, which they have whenever emitted in nuclear fission. The neutrons are slowed down to energies comparable to those of a neutron of gas at the temperature of the material in which they are moving; therefore they are termed as thermal neutrons. Here, Ekin is kinetic energy, 'T' is temperature and 'K' is the reaction constant. The method of slowing down of energetic neutron to low kinetic energies is termed as moderation. In this group of nuclear reaction termed as inelastic scattering, part of the kinetic energy of the projectile is converted to the target nucleus as excitation energy devoid of changing the values of A or Z of either target or projectile. If the projectile is a heavy ion, it might as well become excited. Though, the collision of the projectile and target nucleus making the product does yield in a value of 'Q' more than zero. The reaction path (a) points out that the energy 'Q' is emitted as a γ ray. In the reaction path (b), the Q is retained as the excitation energy of the target comprise. If Eokn > Ecb, the attractive nuclear force dominate and the particles is absorbed via the target nucleus. Supposing Q > 0, the Eomass reduces. This signifies that, Eexe increases and the system is converted to excited compound nucleus.